A couple of short stress hairlines from the rim, wear to the glaze and enamels and a little discolouration. A Pinxton Porcelain Coffee Can. A Pinxton Porcelain Coffee Can. Pattern 48. 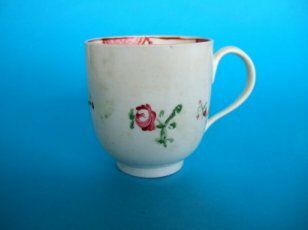 A rare Pinxton porcelain faceted coffee can dating from around 1800. 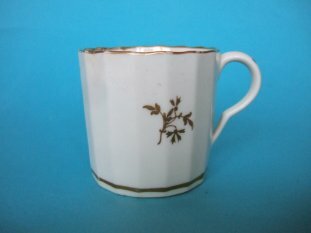 Decorated with a gilt sprig pattern number 48. The base marked 48 in gold. Good No chips or cracks. Typical wear to the gilding. 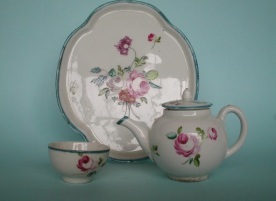 Four pieces from a miniature or toy tea set. c.1770. The tray 16cm long. The teapot 6cm high. The teabowl only 2.3cm high. Decorated with flowers in "Cotten stem painter" style. Firing or stress cracks to the tray. Section missing from teapot neck. A couple of faint stress cracks to the body. Hairlines to the teabowl. The cover (probably to the sugar bowl) re-stuck. 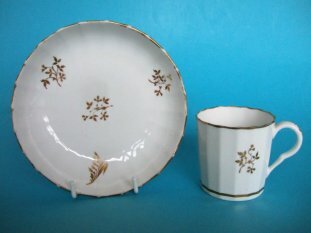 A Spode porcelain facetted coffee can and saucer made as a replacement for or addition to a Pinxton service. Decorated with Pinxton pattern 48, gilt sprigs. The bases marked Spode. Good, no damage, some wear to the gilding.